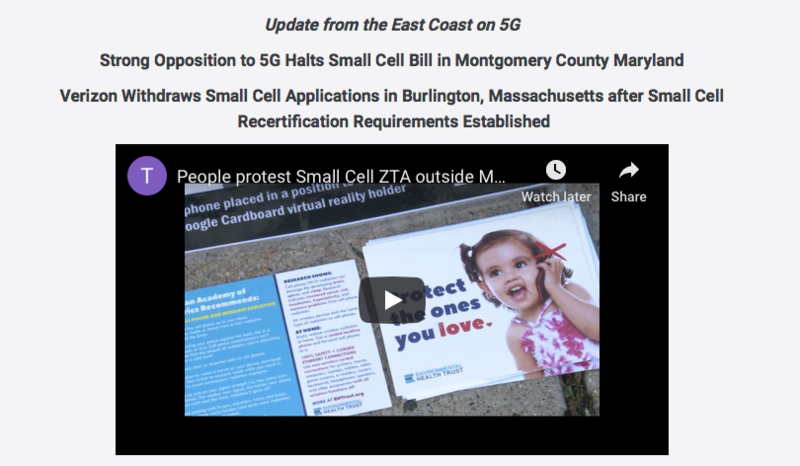 The Montgomery County 5G Small Cell zoning amendment was being pushed by the Montgomery County Executive Ike Leggett (who notable had previously states that cell towers were bad for the environment), County Council President Riemer and Councilwoman Nancy Floreen. In the final Council deliberations Montgomery County Councilman Hucker brought forward an amendment to the regulation that would give public notice and hearings to homeowners with a utility pole in front of their homes. The County staff told him this was not allowed under law and that the county would be preempted. However Councilman Hucker the presented documentation that in fact the county had the authority to regulate both the approval procedure and the setbacks for small wireless facilities to be placed in its ROW and in residential zones. Thus, the passing of the amendment that gave citizens notice and a hearing tainted the otherwise industry friendly bill and was no longer acceptable to industry as it would have forced them to give public notice and hearings. (From Cecelia Doucette in Ashland Massachusetts) Meanwhile in Burlington, Massachusetts, Verizon withdrew their small cell applications upon learning of newly established annual recertification requirement and associated fees as they did not wish to establish a precedent for recertification fees. The Burlington, Massachusetts Small Cells Committee had proactively developed criteria in a new policy for reviewing small cell applications which included an annual recertification of equipment installations, with a fee assessed to the telecommunications vendor to pay for town employee time to oversee the recertification process. The town established a website to share with the public each of the small cell applications, letters of concern, staff comments and reports. Get the Facts on 5g at EHT’s 20 Quick Facts About 5G to get updated on the issues. Download a PDF of EHT Factsheet on 5G and Health. The factsheet is hyperlinked (blue text) to research and sources. It is a great resource for policymakers. Read the research on 5G and health here.